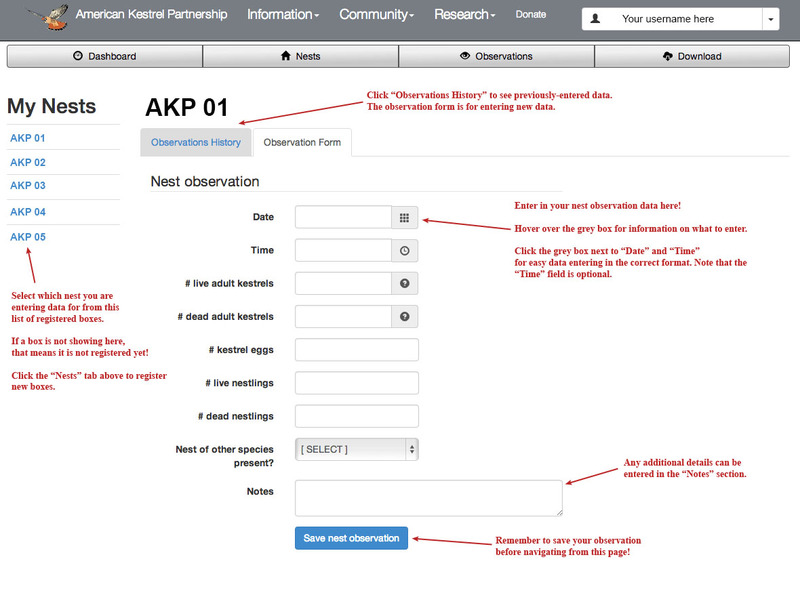 To get to the page displayed by this visual guide, first click on the "Research" button at the top of the AKP website. Then, select "Dashboard." Next, click on the "Observations" button with the little eyeball picture. That will bring you to the page as seen by this guide. For further assistance, feel free to email us at kestrelpartnership@peregrinefund.org! Awesome picture - that female has lovely feathers going on! You can put whatever you wish in the notes section. Often the notes will be used by you - you can note interesting behaviors, weather, or things like "replaced bedding" or "replaced the roof of the box" or other such happenings like that. It's okay to be detailed, as it helps you remember things later! I hope that helps. Feel free to ask more questions! Thanks for the information, Delora. Appreciate your time. 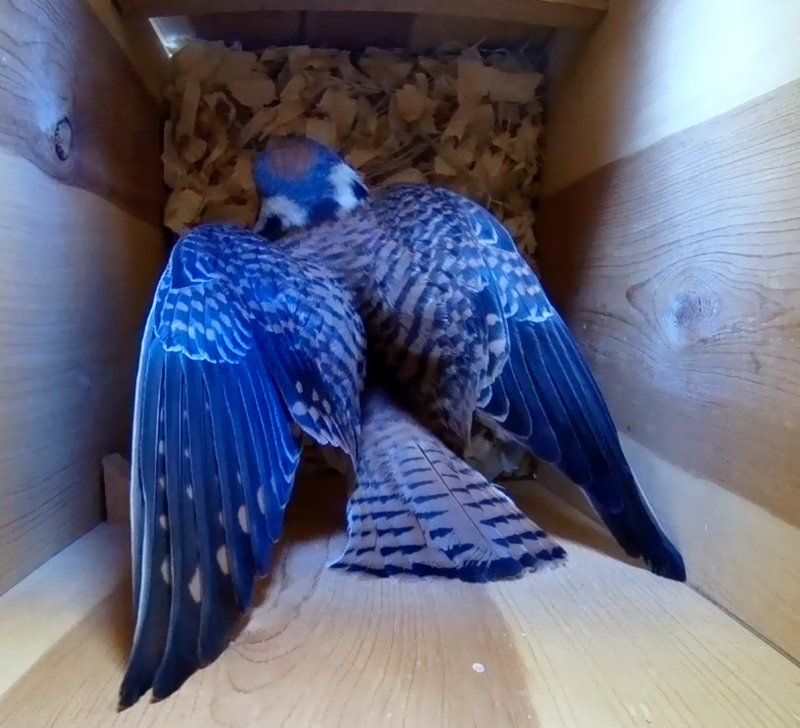 The female and the male have both been active in the box--the male mostly comes in (noisily) with treats and calls for her to come to the meal. She is mostly digging while she is in the box and I never knew they had such a strange style of digging/scratching out their nests! She practically rests on her face and chest and kicks out awkwardly with her feet against the bedding. In the photo I posted above, she was doing that sort of digging and I guess she spreads out her wings for balance since her feet are kicking out. Before we got our camera, I always imagined the nestbox scratching as similar to the way our chickens scratch through the dirt for things to eat, but how wrong was that! No problem! Indeed, their way of digging a scrape is cute, isn't it? I like to call it the "faceplant shuffle." Posted in General Discussion by American Kestrel Partnership 4 years 11 months ago.